On the morning of Sunday 22nd November 2015, Clarinda Chant, Gwen Richards and I took a walk along the old road east of Brackloch (NC1223-1124). Although we set out in full waterproofs, our optimism was rewarded by sunshine later, albeit a bit watery. Birdlife was a bit thin, apart from a small flock of reed buntings, but there was much else to see. On the way back we noticed a small tree covered with lichens in the walled garden of the easternmost house. Although behind a deer fence, it was near enough to the road for us to have a close look. It was next to what looked like an osier Salix viminalis, but the few thin leaves left were not those of any kind of willow known to me, and its identity will have to remain a mystery until next spring. 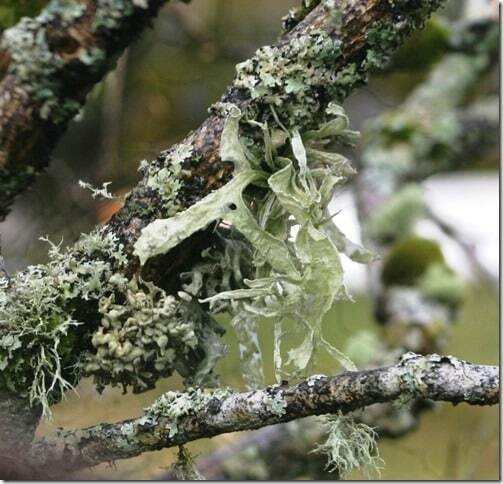 However, some of the large lichens with which the trunk and branches were festooned were more easily identified. The most conspicuous were the greeny-brown thalli of the largest of our foliose (leaflike) lichens, tree lungwort Lobaria pulmonaria, which is a feature of woodland, and isolated trees, on our wet north-western coast, sometimes colonising mossy rock-faces. 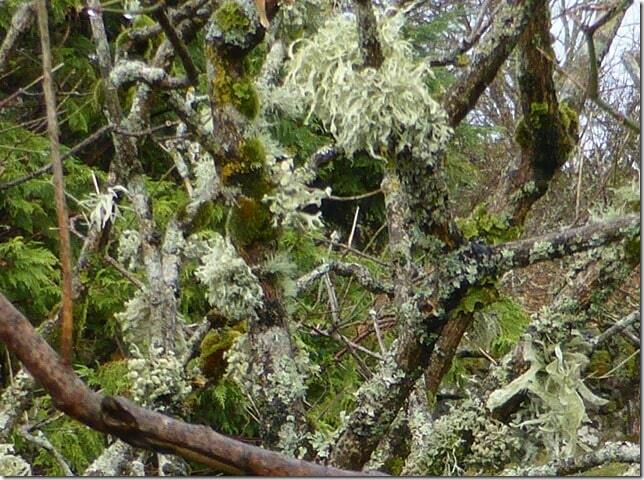 There was also an assortment of grey-green fruticose (shrubby) lichens, including shaggy beard lichens Usnea sp. and the more compact tufted or hanging growths of the genus Ramalina. Amongst the latter was the largest species of the genus, Ramalina fraxinea, with broad, flat branches up to three inches long and half an inch wide (see photographs). This has only occasionally been recorded in Assynt, usually from old trees. It likes nutrient-rich bark, but is very sensitive to sulphur dioxide pollution and the over-enthusiastic use of fertilisers. Curiously, it is much more frequent, and grows much larger, over on the eastern seaboard of Scotland, where I have seen specimens up to a foot long and three inches wide, hanging from the branches of well-lit trees, like so many grubby hankies.